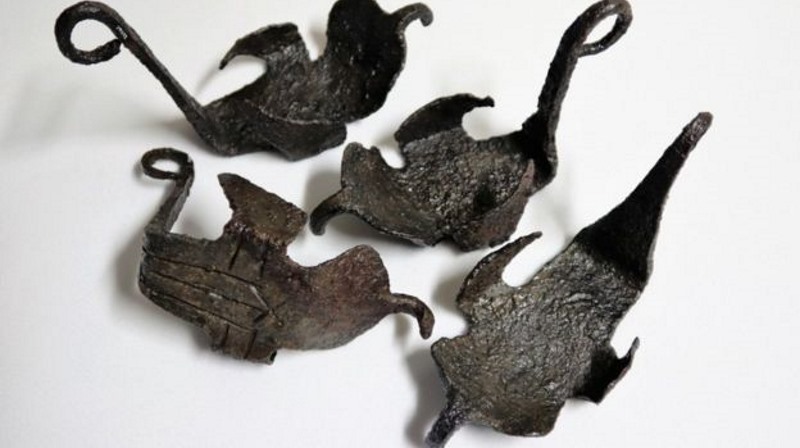 A complete set of four hipposandals – Roman horseshoes – has been uncovered at the site of a former Roman auxiliary fort in northern England, just south of Hadrian’s Wall. Adela Talbot reports. Roman historian specialist Alex Meyer continues to be in awe of the treasure trove that is Vindolanda. For years, the former Roman auxiliary fort, located just south of Hadrian’s Wall in northern England, has yielded a number of finds unique to the site and to the former empire. To date, excavations have yielded well-preserved artefacts such as ink tablets, shoes, combs, swords and textiles. Meyer, a classical studies professor at Western University in Ontario, Canada,, was recently part of a team that unearthed four early Roman hipposandals – shoes worn by horses – at Vindolanda. “The most interesting thing about this is we found all four of the hipposandals. It’s rare and remarkable to find one, but to find all four, deposited like this, is really cool. I’ve seen one other set of four in all my days,” Meyer said. Vindolanda, a designated UNESCO World Heritage Site, which housed some of the most famous documents of the Roman world, has been a location of study for classical studies students since 2012, when Western’s Field School at Vindolanda was developed by professors Meyer and Elizabeth Greene, a Roman archaeologist. Over the years, they have acted as supervisors for excavations and volunteer programs at the fort. The school provides training in field excavation, archaeology and history of Roman Britain for students through excavations and the first-hand study of Roman artefacts unearthed at the site. It is believed that Romans did not use actual horseshoes, which are nailed into the hoof of the horse, Meyer explained. The unearthed hipposandals are more like actual shoes, resembling “soup ladles,” which would wrap around the sole of a horse’s foot. “It’s an interesting find because we’ve always wondered about how Romans treated their horses. We knew about these hipposandals, but they are peculiar to the northwestern part of the Roman Empire. We don’t have a lot of evidence for what happened to horses’ hooves in Pompeii, even more famous archeological sites like that,” he explained. Finding all four hipposandals makes the discovery all the more exceptional, Meyer added. Since they were found in two closely nestled, matching pairs, it appears they were intentionally deposited, or at least discarded, all four at the same time, which is “very odd,” he noted. It is safe to assume they belonged to one horse and we can make all sorts of speculations about this, such as somebody’s favourite horse died, and they buried the hipposandals as a deliberate memorial. The one disappointment was that there was no inscription on the hipposandals, Meyer added. “We are still excavating that area, and we will continue to excavate that area for much of next year, as well. It may be that we found early bits of a religious sanctuary where they are dedicating things like that,” he continued. All of the items excavated at Vindolanda have been well-preserved because the site is anaerobic; there is no oxygen in the soil, he explained. Nine Roman forts were built at the site, one on top of the other. When one fort was knocked down, a new foundation of clay was set, and a new fort built on top. This kept oxygen out and without oxygen, iron can’t oxidize and rust. “This find gives us insight into the use of hipposandals in the military context. Normally, people will argue that they were used for draft animals; I’m not sure if there were draft animals at Vindolanda but it seems likely that it was cavalry that used hipposandals, too,” said Meyer. The team that discovered the hipposandals includes Meyer, Andrew Birley, chief executive and director of excavations for The Vindolanda Trust, alongside a team of volunteers that included Western student Sarah Bentley and donors Balfour and Marg Noble, who funded a scholarship for Western students to excavate at Vindolanda. This report originally appeared in Western News.